Tens of thousands of Chileans have marched through Santiago to urge new President Michelle Bachelet to carry out her left-leaning reform programme. The key demand of the activists was that the Pinochet-era constitution be replaced with a document that protects the rights of all citizens. The student movement, which led much of the protests against the previous centre-right government, did not take part in the protest. Ms Bachelet is serving a second term. She won last December's election by a wide margin, and promised to overhaul the constitution. 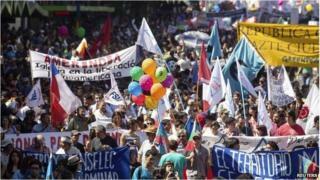 Protesters said they wanted to "warn" Ms Bachelet about their expectations. "This is not a protest against Ms Bachelet or for her, it's just an alert for the political class so they know people have demands," said Oscar Rementeria, a spokesman for gay-rights group Movilh. Organisers said 100,000 people showed up for the protest, although the police put the figure at 25,000. The student movement stayed away because it has been working with Ms Bachelet on education reforms. The "March of all Marches" was mainly peaceful, but there were a few clashes towards the end. At least three policemen were injured and 50 protesters arrested, authorities said. Ms Bachelet took office on 12 March, having won the elections last December to succeed the conservative Sebastian Pinera. Her campaign promised to increase spending on education, besides improving healthcare and reducing income disparity. Ms Bachelet also wants to increase taxes to offer free university education and reform political and economic structures dating from the 1973-1990 dictatorship of Gen Pinochet. Chile is one of the richest countries in Latin America, but tens of thousands have staged protests over the past few years to push for a wider distribution of wealth and better education.